CVN-78 USS Gerald R. Ford. President Ford served aboard USS Monterey in the Pacific during World War II, and was the first president to serve aboard an aircraft carrier. He helped guide the nation through the end of the Vietnam War and the bicentennial of American independence. USS Gerald R. Ford (CVN-78), the first of class of the US Navy next generation aircraft carrier (formerly known as CVN-21) officially received its name today. USS Gerald R. Ford represents the first new design since the USS Nimitz (CVN 68), which was launched in 1972. The new aircraft carrier will be able to sustain higher operational tempo, while costing less to operate and maintain, saving the Navy a projected $4 billion over the ship’s 50-year lifespan. Capt. John F. Meier has already been named as the ship’s first commanding officer. He will be responsible for monitoring the final months of construction and likely be onboard when the Ford goes on its first sea trials. 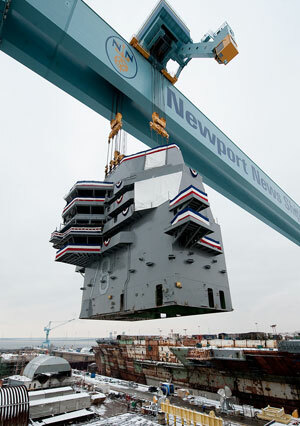 50 years after commissioning the first nuclear powered aircraft carrier (CVN-65 USS Enterprise), the US Navy christened today the first ship of the third generation of nuclear powered carriers. Larger and much more advanced version of the $13 billion ‘floating airport’, the new Ford class is designed to carry naval air power well into the 22nd century. The new carrier uses the basic Nimitz-class hull form but incorporates several improvements, including features permitting the ship to generate about 25% more aircraft sorties per day, and generate more electrical power to support the propulsion and ship systems and new launch and retrieval systems enabling the operation of a wider range of aircraft. It is also designed for higher efficiency, permitting the ship to be operated by several hundred fewer sailors than a Nimitz-class ship, significantly reducing life-cycle operating and support (O&S) costs. Rear Adm. Thomas Moore, the Navy’s program executive officer for aircraft carriers, told Seapower Magazine the ships of the Ford class will serve for 94 years from 2016, out to 2110. CVN 78, the lead ship and the first carrier built after the 10-ship Nimitz class, is expected to serve 50 years, 23 before a four-year refueling and 23 years afterward. 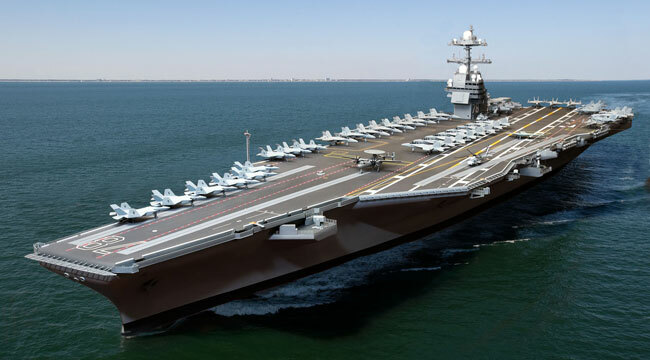 Its two sister ships are already in the planning – USS John F. Kennedy, (CVN-88) will be laid down at Huntington shipyards in late 2013, and is expected to be commissioned in 2016, in time for the USS Nimitz (CVN 77) retirement. 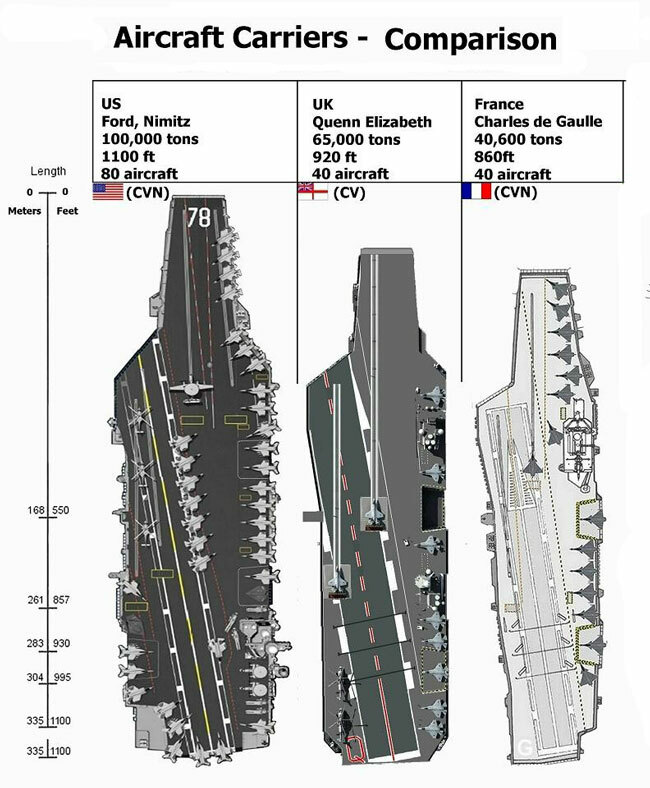 USS Enterprise (CVN-80) will be laid down at the same location in 2018. the Navy plans to build at least 10 Ford class carriers through the next 40 years, at least until the last Nimitz-class carrier will leave the fleet in 2057. Construction of the Ford began in November 2009. As the lead ship of a new class, USS Gerald R. Ford would take more time to complete than its follow-on sister ships. Moore said the labor for CVN 78 will total 50 million man-hours, compared with the 40 million used to build the Nimitz-class ships. CVN 79 is expected to require 43 million to 44 million man-hours to build. 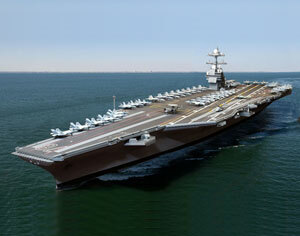 The cost of CVN 78 is expected to reach $12.9 billion, compared with an original estimate of $10.5 billion. Moore said he expect the next carrier, CVN 79, to cost $1.2 billion less than CVN 78 because of lessons learned in processes and of the technology already developed. 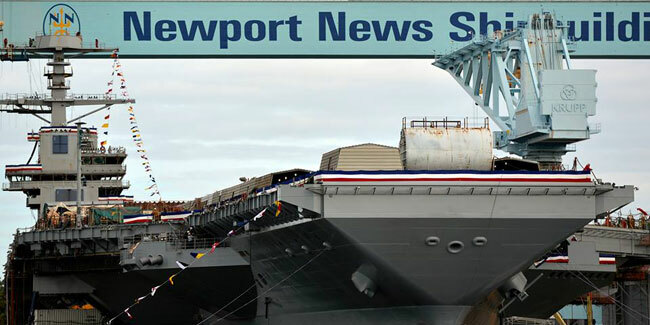 Newport News Shipbuilding is using a full-scale three-dimensional product model to design and plan the construction of the Ford-class of aircraft carriers. The significant investment allows visual integration in design, engineering, planning and construction. CVN 78 has been floated in a graving dock, where the christening ceremonies took place today. This ceremony was delayed four months to enable the shipyard to complete more of the ship in the convenience of the graving dock. The ship, currently at 77,000 tons, couldn’t accept any more weight until it is launched from the graving dock. 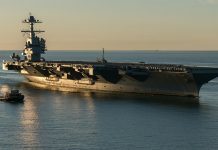 After launch, the carrier will be moved to a pier to begin a 27-month outfitting period, after which it is scheduled to be commissioned during the second quarter of fiscal 2016. The island is positioned 140 feet further aft and three feet further outboard than the island of the Nimitz’s class, thus clearing more deck area for aircraft operations and support. The route of weapons to the aircraft stops on the flight deck has been replanned to accommodate higher re-arming rates, and in turn higher potential sortie rates. Moving the island creates deck space for a centralized re-arming and re-fueling location. The new path that ordnance follows does not cross any areas of aircraft movement, thereby reducing traffic problems in the hangars and on the flight deck. This reduces the number of times that an aircraft will have to be moved after landing before it can be launched again. 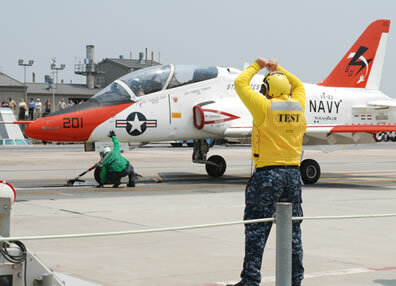 Fewer aircraft movements require, in turn, fewer deck hands to accomplish them, reducing the size of the ship’s crew. The ship is designed to require 800 fewer sailors to operate, and for 400 fewer personnel to embark with an air wing on the ship, in total, around 4,300 hands, compared to the average 5,500 hands operating a Nimitz class carrier. The flight deck of CVN 78 has been completely redesigned and rearranged. The end result is a 25 percent increase in the ability to launch and recover aircraft missions. In order to accomplish this, the carrier has three aircraft elevators instead of four, and the island is positioned 140 feet (42.6 m’) further aft. The ﬂow of weapons has been signiﬁcantly upgraded, with the installation of new electromagnetic hoist system replacing cables. 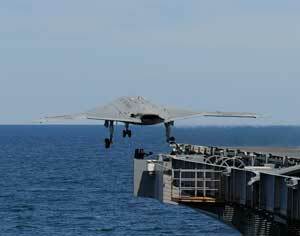 The X-47 UCAS-D currently undergoing carrier suitability flight tests is the only fixed-wing drone designed to operate from aircraft carriers. Following these tests it will also be fitted with aerial refueling capability, preparing for air refuelling evaluations in 2014. 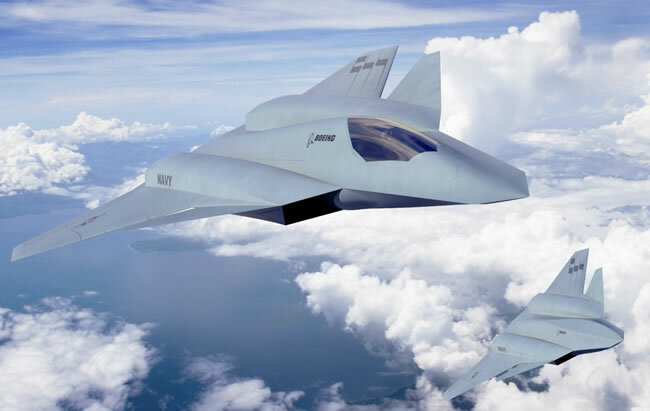 The carrier will be capable of carrying up to 90 aircraft including the F-35C carrier variant of the Lockheed Martin Lightning II, Boeing F/A-18E/F Super Hornet, Northrop Grumman E-2D Advanced Hawkeye, Boeing EA-18G Growler electronic attack aircraft, Sikorsky MH-60R/S helicopters and future UCLASS unmanned carrier launched air vehicles systems or unmanned combat air vehicles. The minimum weight limit is above the weight of all UAVs. An inability to launch the latest additions to the Naval Air Forces is a restriction on operations that cannot continue into the next generation of aircraft carriers. 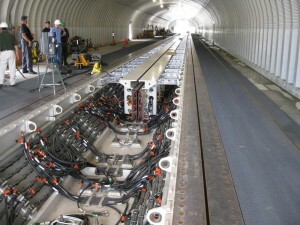 The Electromagnetic Aircraft Launch System (EMALS) provides solutions to all these problems. An electromagnetic system is more efficient, smaller, lighter, more powerful, and easier to control. Engineers at Naval Air Engineering Station Lakehurst, N.J., work on the EMALS trough at the System Functional Display site. U.S. Navy Photo. Increased control means that EMALS will be able to launch both heavier and lighter aircraft than the steam catapult. Also, the use of a controlled force will reduce the stress on airframes, resulting in less maintenance and a longer lifetime for the airframe. The current system is unable to capture UAVs without damaging them due to extreme stresses on the airframe. UAVs do not have the necessary mass to drive the large hydraulic piston used to trap heavier manned planes. By using electromagnetics the energy absorption is controlled by a turbo-electric engine. This makes the trap smoother and reduces shock on airframes. Even though the system will look the same from the flight deck as its predecessor, it will be more flexible, safer, more reliable, and require less maintenance and manning. Unlike the Nimitz, CVN-78 will have no catapult-specific restrictions on launching aircraft, but still retains four catapults, two bow and two waist. The lighter software-controlled advanced arresting gear system increases the ability to recover smaller aircraft with reduced wear. The combined contribution of those capabilities and the vessel’s higher efficiency would enable the Ford Class carrier to increase operational tempo, generating about 25 percent increase in sorties per day, compared to Nimitz-Class carriers. The ship will be equipped with two newly-designed reactors that will provide propulsive power driving four shafts, supporting a cruising speed over 30 knots. The new A1B reactor plant built by Bechtel is a smaller, more efficient design that provides approximately three times the electrical power of the Nimitz-class A4W reactor plant. The modernization of the plant led to a higher core energy density, lower demands for pumping power, a simpler construction, and is expected to require less maintenance over its lifetime. The reactors deliver 250 percent more electrical capacity than previous carriers, supporting the ship’s EMALS. 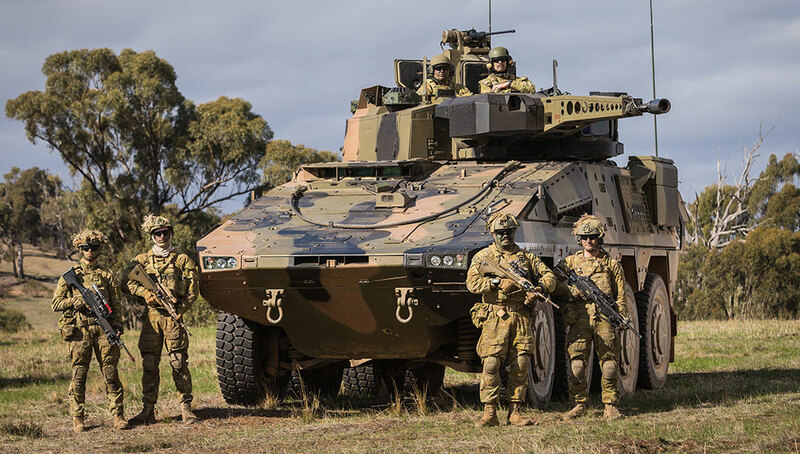 Additional power will also provide for the integration of future directed energy weapons, expected to be fielded in the future, providing more effective self protection for the carrier, particularly against ripple attacks of cruise missiles, ballistic missiles or surface bound threats. The designers have also planned the vessel for more efficient operation, the new class will have 12 year operating interval before dry-dock maintenance are required. Reduced maintenance is also reflected in the fewer manpower needed to operate and maintain the ship. In addition, more air-conditioned space means reduced maintenance requirements for equipment and electronic systems. 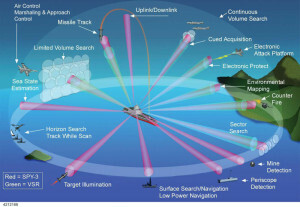 Functional scheme of the DBR radar, developed as a common sensor for DDG-1000 and CVN-21 platforms. [/ismember]The Ford will use an AEGIS class radar, employing six Dual-Band Radar (DBR) panels developed by Raytheon for both the DDG-1000 Zumwalt-class guided missile destroyers and the Ford-class aircraft carriers. By replacing six to ten different radar antennas with a single six-faced multi-mission radar, attached to the outer walls, the island can be kept smaller. The DBR works by distributing multiple emitters of X-Band AN/SPY-3 multi-function radar and S-band Volume Search Radar (VSR) emitters, distributed into phased arrays. Each system has three phased array faces. 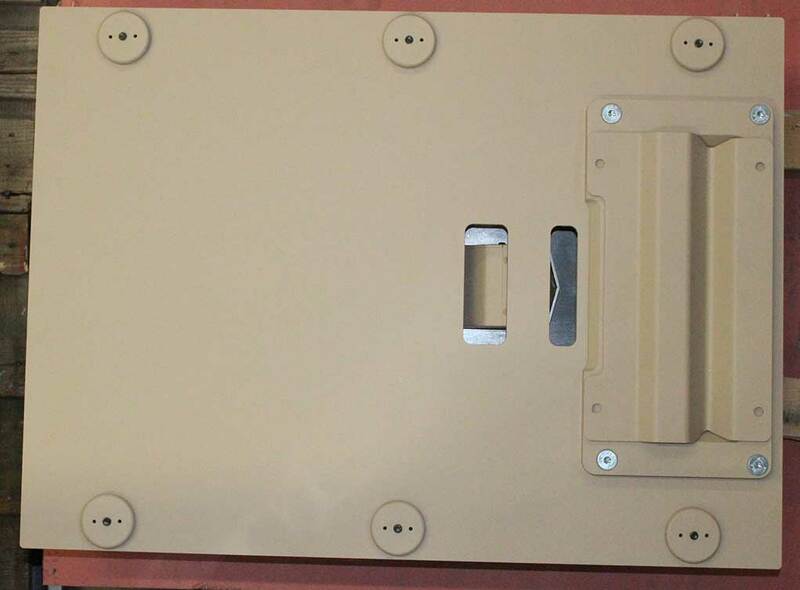 [ismember]AN/SPY-3, operating at X-band with high-accuracy, narrow beam width and wide frequency bandwidth, provides superior coverage and effective discrimination of low-altitude targets. 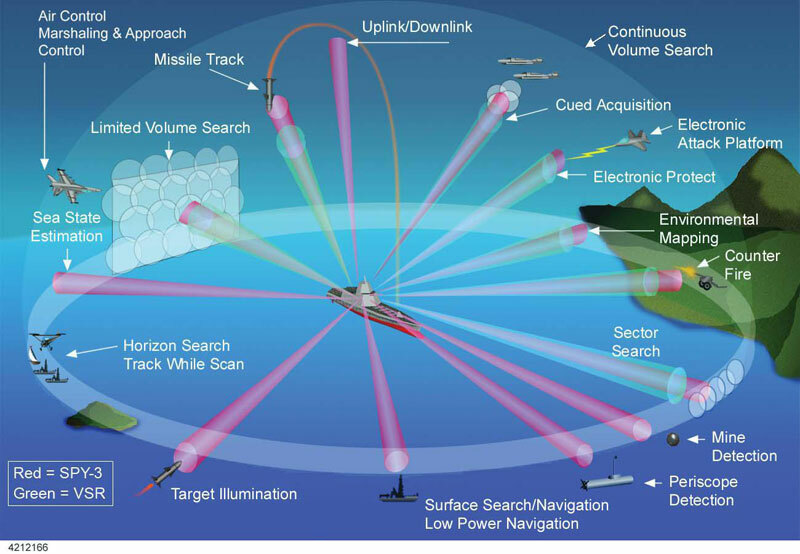 It also provides target illumination and uplink/downlink capabilities for Evolved SeaSparrow (ESSM) missiles. 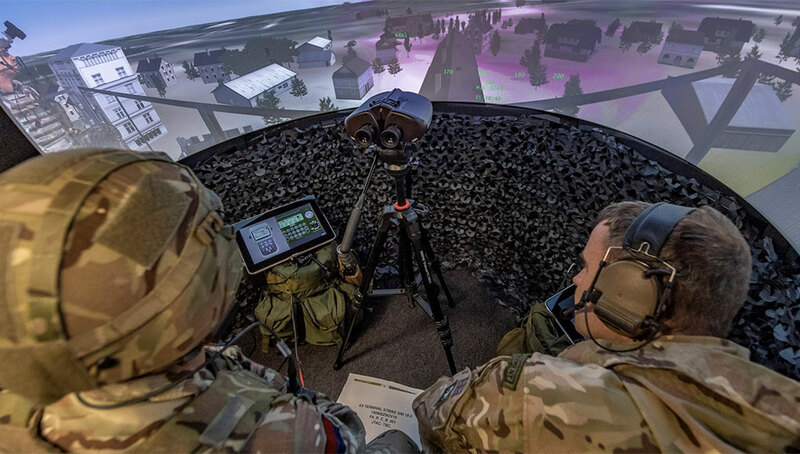 Using S-band, VSR delivers effective, all-weather search capabilities via its high-power aperture, and narrow beam width, enabling it to accurately resolve and track targets. 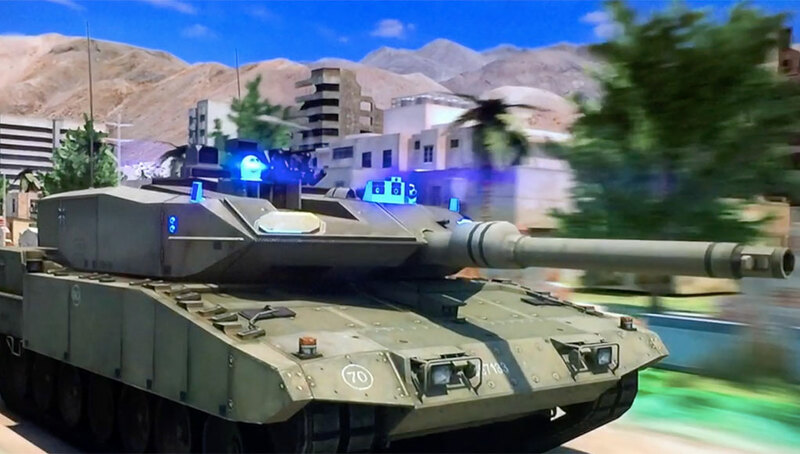 Many search and track functions, such as cued acquisition and precision track (providing high update rate, fire control quality data) can be allocated to either or both frequencies, automatically or through command and control direction. Operating as an integrated warfare system, the Ship Self-Defense System (SSDS), has been developed to be flexible in supporting the carrier’s operation while providing self defense to the platform. The carrier will be armed with the Raytheon evolved Sea Sparrow missile (ESSM), which defends against high-speed, highly manoeuvrable anti-ship missiles. 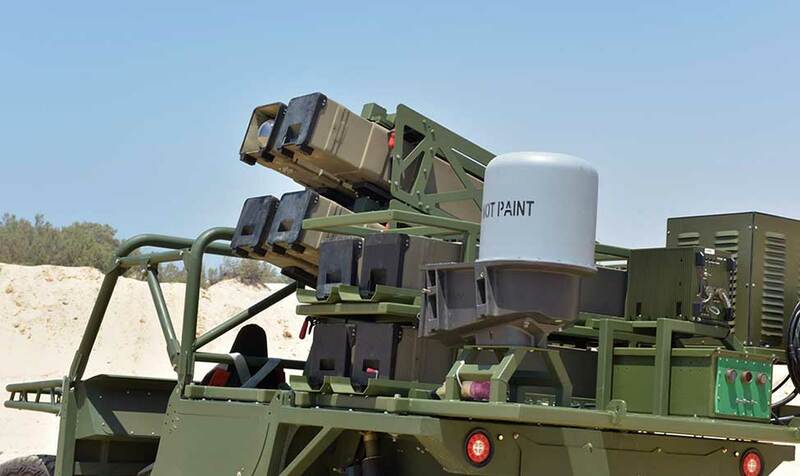 The close-in weapon system is the rolling airframe missile (RAM) from Raytheon and Ramsys GmbH.